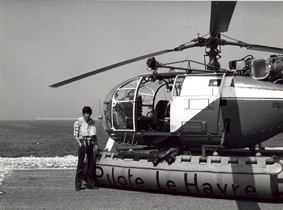 The first helicopter service at the pilot station of Le Havre goes back to 1976. It was the time when Le Havre port built the Antifer oil terminal. Thus, the boarding of pilots aboard super tankers then became a problem: how to serve these vessels conveniently and with the best possible safety conditions when they are situated more than 25 miles out to sea? The station considered several solutions and decided upon the use of a helicopter. The choice for an “Alouette III 316B” was made. Hence, by taking this step the station became a pioneer in this field as no other station in France or abroad had ever been equipped with this type of machine. The use of a helicopter was taken up later by the pilot stations of Dunkirk and the Gironde. Once purchased, the use of this machine was not only limited to the boarding of pilots aboard the Antifer oil tankers. Its use was extended to include serving very large vessels such as oil tankers, bulk carriers and other container ships. 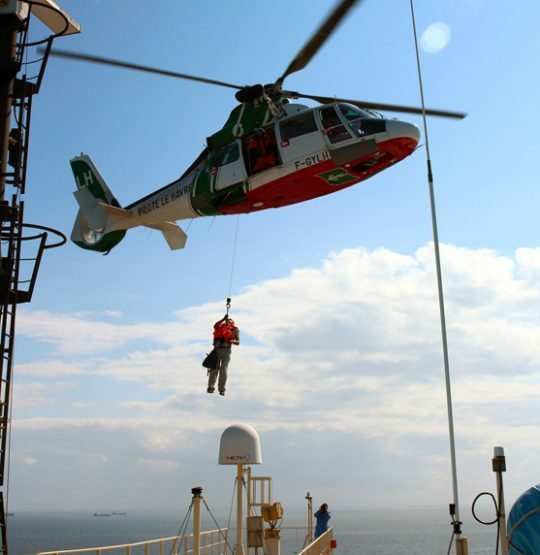 Today, the helicopter carries out 1800 missions of embarkations or disembarkations of pilots per year (1754 in 2007, of which 400 landed on the deck of the vessel), day or night, in almost all weather conditions. The helicopter is permanently crewed by one of two teams who change over every seven days. One crew is made up of a helicopter pilot and a winch man. During operations the maximum seated capacity is 5 passengers plus the crew. Our machine is fitted with an AIS allowing it to have access to a certain amount of instantaneous relevant information about the vessels (bearing/range, heading, speed, rate of turn, …). Access to this information is available to both the helicopter pilot and the mechanic. This equipment is usually set up by the mechanic winch man enabling him to forward information to the pilot concerning the different vessels. The AIS also has a transmitting option. This option allows for a follow-up and a recording of the helicopter track by the port control station, the pilot station or the ship’s bridge. Any tank cleaning operation must be stopped. Any open tank must be shut before the arrival of the helicopter. During the helicopter landing, fumes likely to be evacuated by safety valves will be dispersed by the rotor blow. Ore carriers: Boarding will be on a hatch cover either by winching or landing. During dry weather, it is necessary to plan the washing of the hatch cover in advance in order to avoid dust projection. On this type of vessel, when outbound, it is preferable to favour winching from the bridge wings in order to avoid the inconvenience linked to dust being lifted by the rotor blow. Container ships: These ships are usually served by winching on the bridge wing, or on the forecastle if the wing is not practicable. Some ships are fitted with marked areas in line with the International Chamber of Shipping recommendations. A landing area is marked with a ‘H’ measuring 3.60 m by 1.80 m circled by two continuous rings. These two rings mark out an area cleared of any obstacle higher than 0.10 m for the inner ring and 0.25 m for the outer ring. In order to be used by the Dauphin N3, these rings should have a diameter of more than 7 m for the inner one, 14 m for the outer one, and be centred on the same manoeuvring area of more than 18 m, and free from any obstacle higher than 1.25 m marked out by a dotted ring. A winching area must allow the operation to be carried out at a height of less than 12 m. It must have a diameter of at least 5 m, be free from any obstacle and located at the centre of a manoeuvring area free from any obstacle of more than 3 m in a diameter of 21 m, and of more than 6 m in a diameter of 28 m, marked out by a dotted ring. 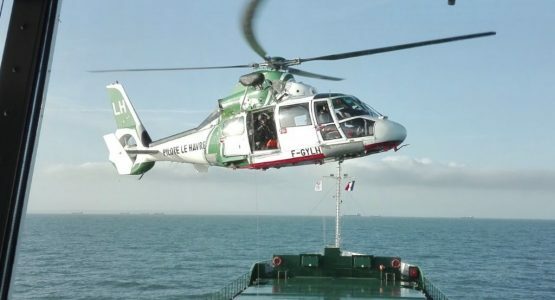 On ships not fitted with such areas it is still possible, in practice, for the pilot of the helicopter to find a space of sufficient dimensions during daytime to winch totally safely, unless there are a lot of masts. In the case of doubt when disembarking, the helicopter pilot carries out a reconnaissance flight before the maritime pilot leaves the bridge. 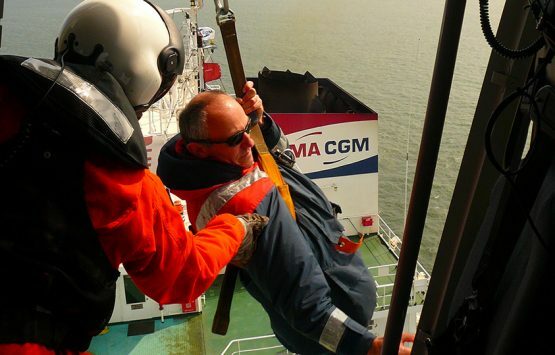 The helicopter pilots detain a ship data base allowing them to anticipate the winching location.